Floyd Mayweather says he has "nothing left to prove in boxing" after confirming he will now retire following his record-equalling win. The unbeaten American cemented his legacy with a 49th career victory when he beat Andre Berto in Las Vegas on Saturday night, a record which matches the benchmark set by former heavyweight champion Rocky Marciano. Mayweather, 38, easily outboxed his younger opponent over the 12 rounds to retain his WBC and WBA welterweight titles with a unanimous decision. "I've been in the sport of boxing my whole life and they say I'm wrong for saying I'm the best," Mayweather said of his career during a lengthy press conference following his victory over Berto. "Every champion - [Muhammad] Ali, Sugar Ray Robinson, Sugar Ray Leonard, Larry Holmes - the list goes on and on. They opened up the doors and paved the way for where I am today and I'm appreciative. "But now the young fighters say, 'We want to be like Mayweather.' It's not cool to take punishment in the ring. I'm not perfect but I strived to be a perfectionist." Mayweather, who previously performed a U-turn when he came back from a 21-month retirement to fight Mexican Juan Manuel Marquez in September 2009, was asked if might be tempted to return for a 50th fight. "My career is over. It's official," he replied. "I'm financially secure and I'm in good health. "You've got to know when it's time to hang it up, so I think it's about time for me to hang it up. I'm close to 40 years old, I've been in this sport 19 years, been world champion for 18 years, I've broken all records. "There's nothing left to prove in the sport of boxing." Mayweather has made more than $700m during his stellar career and was never in trouble in his final outing against Berto, landing 232 of 410 punches thrown, while Berto connected with just 83 of 495. Mayweather also dominated the jabs count, connecting with 83 of 191 compared to his opponent's paltry 39 of 301. 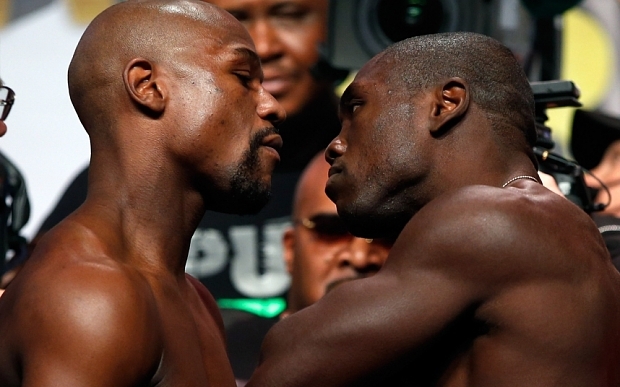 "Andre Berto has heart, a tremendous chin, he wouldn't lay down," Mayweather added. "It was a good fight. I knew he would be a tough competitor. Experience played a major role tonight. He is a very athletic boxer. What can I say? I was the better man tonight." Beaten challenger Berto said: "I pushed him to the limit, but he was just better. "I was in great shape but it was difficult to fight him. He was really, really slippery." "He knows how to con his way in certain situations to keep his distance or to use that moment to get some rest time or to use clinches to breathe and come back with a few punches. "I used a lot of speed but he was really crafty, he was using little things to kind of get me out of my rhythm. We pushed him to the limit but we fell short." Berto, who described himself as a "man on a mission" during the build-up to Saturday's fight, was asked to assess Mayweather's standing among the pantheon of boxing greats. "He's sharp but it's hard for me to say because I haven't been in the ring with Muhammad or Marciano," added Berto. "But right now, for him to be 38 years old and still have that speed and that timing, it's unheard of. I definitely commend him for that. "The run he's had for 19 years, being world champion and continuing to move forward to greatness. As a fighter, not too many people can do that."